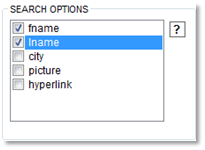 Choose the fields for the search results page in the same way as above for the Search form fields. To change the order of the fields as they appear on the Search Results Page, hold the control (CTRL) key down and use your mouse to click and drag items in the list. Specify which fields you'd like to appear with totals at the bottom of the Search Results (aka Report) page. NOTE: only those fields that are numeric type and have been selected on the search results page will show up as possible column totals. 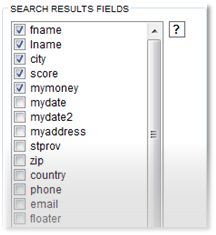 If the column total box is empty then there were no numeric type fields chosen for the search results page. To display the total number of records at the bottom of the search results page check this box.